I have always loved embroidery, since I learned hand-sewing as a little kid and made up my own fun projects for my dolls. But recently, with young children of my own, beautiful, portable hand-stitching projects I can easily pick up, and just as quickly put down, have been a real creative joy for me… and much more realistic than hours of solo machine sewing (someday!). 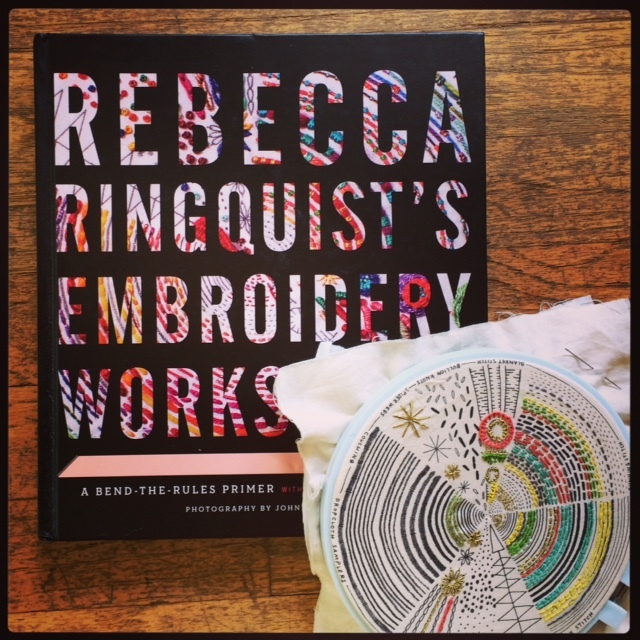 I was so lucky to get a review copy of Rebecca Ringquist‘s gorgeous new book, and after I met her at her lovely Collage event this spring, I’ve spent the last few months stitching away on a few of her samplers and taking lots of inspiration from her generous, wonderful work. Rebecca’s ability to blend vintage and antique pieces with her own very modern approach, in fascinating layers, speaks to so much of what I love about craft. The chance to create beauty without the pressure of perfection is so freeing. This is the sampler that comes tucked in the back of the book – so cool! I kept my pearl cotton colors for this one in a sunny summer palette and mixed in some gold floss as well. It’s been a perfect summer project, worked at a fun and intermittent pace, while I’ve finished two of her other samplers to the last stitch. 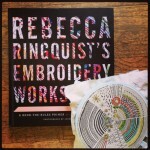 Rebecca’s book combines instructions for basic and intermediate embroidery stitches with colorful photos and hand-drawn illustrations of her own work. Her style and approach are just delightful. 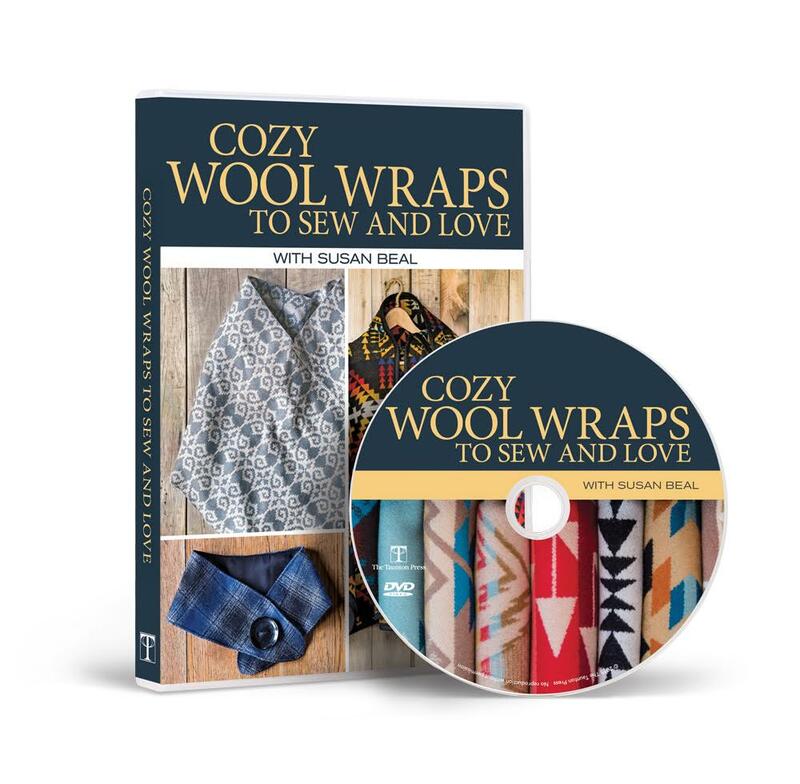 This book will not only teach you how to stitch – whether you’re a beginner or a longtime embroiderer who could use a fun refresh – but will also inspire you to love your stitches and what you can build them into. 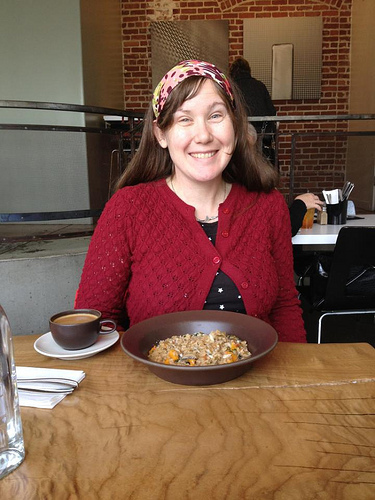 Rebecca kindly agreed to an interview with me about her work – and offered up a very generous giveaway of one of my favorites of her samplers! (See below to enter.) Thanks so much, Rebecca! 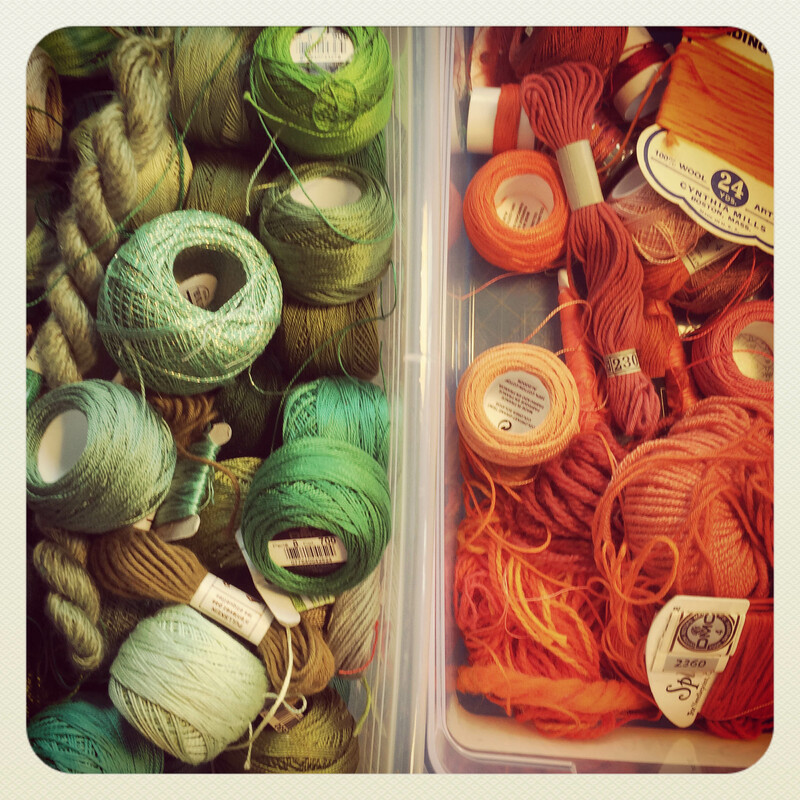 How do you organize your pearl cotton, floss, and embroidery supplies? I keep my embroidery threads in clear boxes, sorted by color. They are (for the most part) the plastic shoe boxes from the container store. Here’s a link. 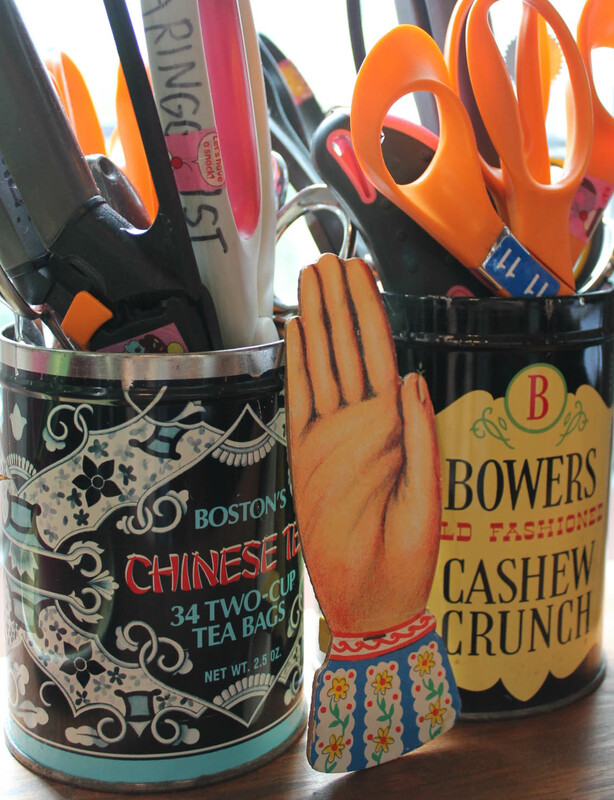 I keep scissors, markers, rulers, paintbrushes, etc. in old tins. Do you have a favorite stitch these days? I’m a little shy to say that my favorite stitch is, and probably always has been the back stitch. It is the most versatile, the most similar to a simple drawn line. I use it constantly. Second favorites are the running stitch and couching. One of Rebecca’s favorite Paisley samplers – the humble back stitch beautifully connects the more complex stitches! 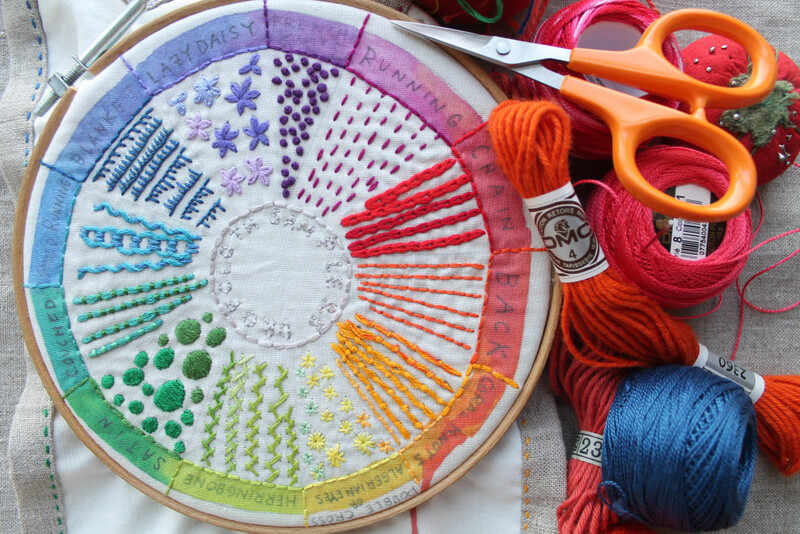 I love how distinctive each of your samplers are, like the color wheel with its beautiful circular pattern divided into 12 colorful sections, each with its own stitch. What inspires you to create a new design? 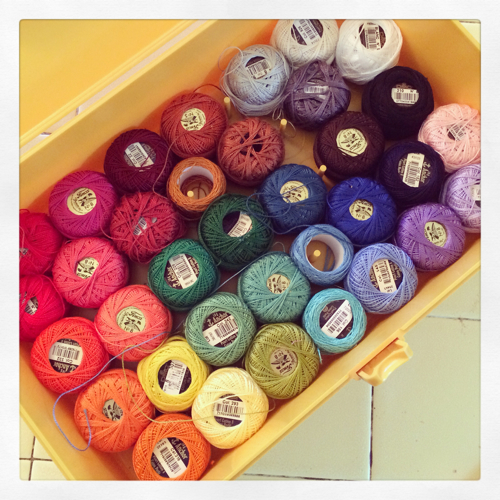 Rebecca’s take on her gorgeous Color Wheel sampler! 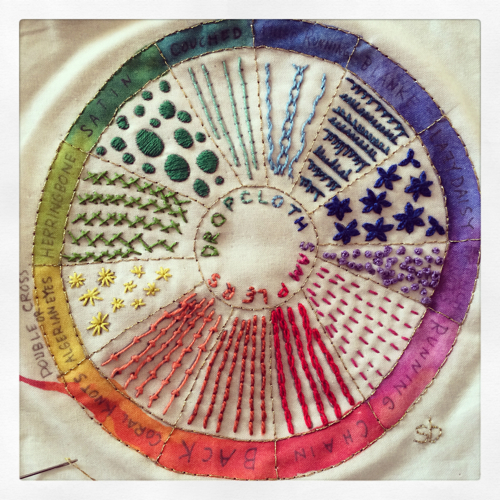 I bought a Color Wheel sampler at Rebecca’s event at Collage, and have just loved working on it. I finished the edging and perimeters of mine with single strand back stitch in gold floss, and thought the effect was subtle, but gorgeous. There are so many ways to personalize such a bold and graphic design, and choosing the twelve colors is a lot of fun too! my Color Wheel sampler, just after I finished and signed it! Love this project. Rebecca has graciously offered up my favorite of her samplers as a giveaway prize to one of my readers, a Color Wheel sampler ready for you to stitch! 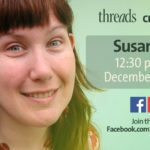 To enter, please leave a comment here on this post, mentioning something you love about embroidery, or how you learned, or anything else fun that comes to mind. 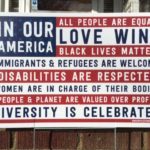 I’d love to see your work if you’d like to share, or link to someone else’s that inspires you. Please comment by midnight Pacific time Wednesday, August 12, one week from today. Good luck!! Want to see more of Rebecca’s work? 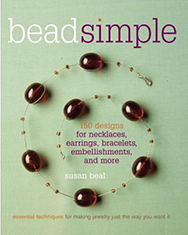 • Here’s her book at Powell’s – or of course you can find it in her shop or at your local bookstore. 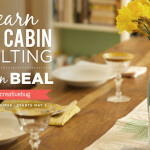 • She teaches a wonderful Creativebug class in embroidery, too! • Find her samplers in her Etsy shop here. • And her Instagram is super fun to follow, don’t miss the #dropclothsamplers tag to see lots more of her pieces brought to life! Now that she’s living in Portland, she’s sharing some beautiful photos of my favorite city, which has been so nice too. I’m excited to cross paths sometime soon! The embroidery piece Pearl & I started and collaborated on at Rebecca’s Collage event – she drew, I stitched! 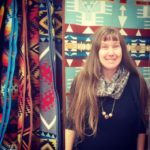 I started with embroidery as a kid, doing cross-stitch and eventually learning more stitches. I picked it up again when my pals started getting married & I found embroidered hankies were a welcome gift to new (maybe a little weepy) brides.I checked out Rebecca’s book from the library before a beach trip this summer & spent the whole week practicing my stitches on a scrap of old tablecloth. It’s so nice to be excited again about a craft that I’ve been doing since childhood! I’ve been doing a lot of cross-stitch lately and have started working with hand-dyed threads and fabrics. They are so fun to work with! The latest embroidery I’ve done is little pieces on my son’s t-shirts. It’s a fun way to make a shirt personalized with some of his current loves. I just drooled over that book in Barnes & Nobles the other day. I’m brand new to embroidery and just purchased my first pattern which happens to be Rebecca’s Original Sampler (this one: https://www.etsy.com/listing/95726411/original-embroidery-sampler-by-dropcloth?ga_order=most_relevant&ga_search_type=all&ga_view_type=gallery&ga_search_query=dropcloth%20sampler&ref=sr_gallery_2) I only started being “crafty” about 5 years ago and have since picked up crochet, cross stitch and am foraying into the embroidery world. I love how versatile it is and how many different creative options I have! 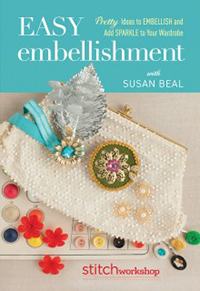 I recently borrowed this embroidery book from the library and promptly added it to my wish list. Her samplers are also at the top of my list, but I’m trying to finish my mermaid before I treat myself. Thanks for the giveaway, Susan! Love the beautiful pictures! The metallic gold on your sampler is such a beautiful, complex choice. 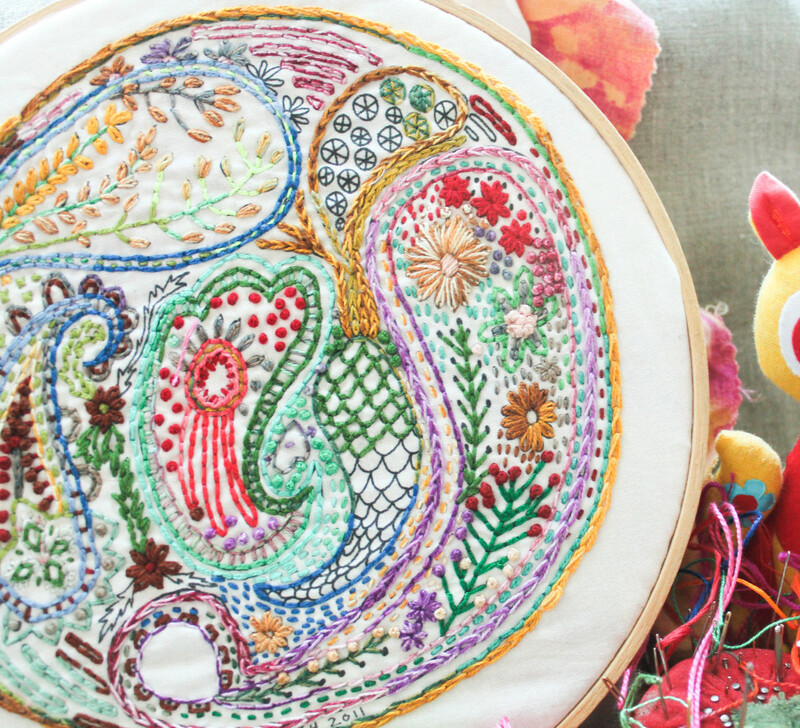 I’m having lots of fun with my embroidery too – just choosing the colors feels like such an adventure. Absolutely love that color wheel! I like to create and try new things. This would be a great starter. 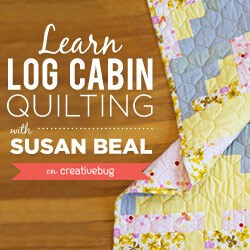 I loved seeing what you were working on a few weeks ago, Susan! 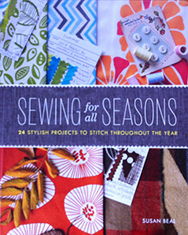 Super inspirational, made me ready to get going with some embroidery again! I’ve been planning out some sewn shibori that might also need to be embroidered! Oh, I love that I can take embroidery with me easily! I used to do it on long car trips when I was a kid, and I don’t know why I ever stopped. Recently my grandmother passed away and I inherited her stash of dishtowels, embroidery floss and iron-on templates. 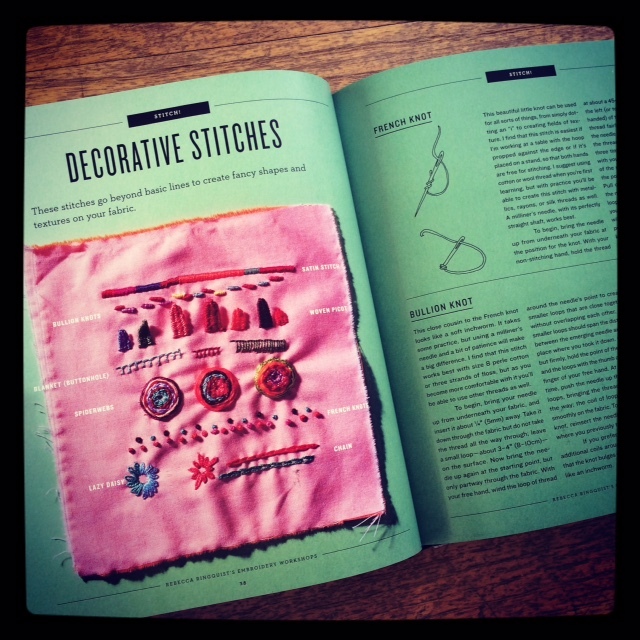 ive actually only done a few embroidery projects and I taught myself…so there is definitely took to learn more. 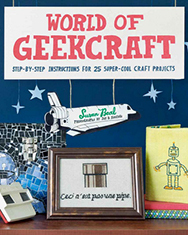 I’ve considering buying a sampler like this as I only know straight stitch and French knots. My older daughter has been embroidering her own “merit” badges for a jacket. I’d love to have her be able to play on one of Rebecca’s samplers! I’ll have to look for the book. She needs a good resource book! I love the longevity of embroidery. I am still using pillow cases that my grandmother embroidered in the 1960s. And they are perfect! oooh I would love to win! I love her samplers! I really like how portable embroidery is. I spend my train rides embroidering a lot. i learned to cross stitch when i was about seven, then didn’t do too much needlework until i was an adult and dabbled in embroidering pillow cases, tea towels, a few crewel projects….i like it because it’s portable, and often a nice break for me between other crafts. Gorgeous pictures! I love Rebecca’s work. I’ve been cross stitching for years but I would love to start embroidering. I’ve added Rebecca’s book to my wishlist. Your collaboration with Pearl is so adorable! I started embroidering when I was a teenager. My mom had a few tea towels that had the printed image on them, so all I had to do was stitch on the blue ink. I really got into it and she taught me some of the fancier stitches. Lately, I’ve been just drawing my own simple designs and stitching them. I find it very relaxing and is a hobby I can easily take anywhere I have a few moments (or more) to work on. These samplers are so inspiring! 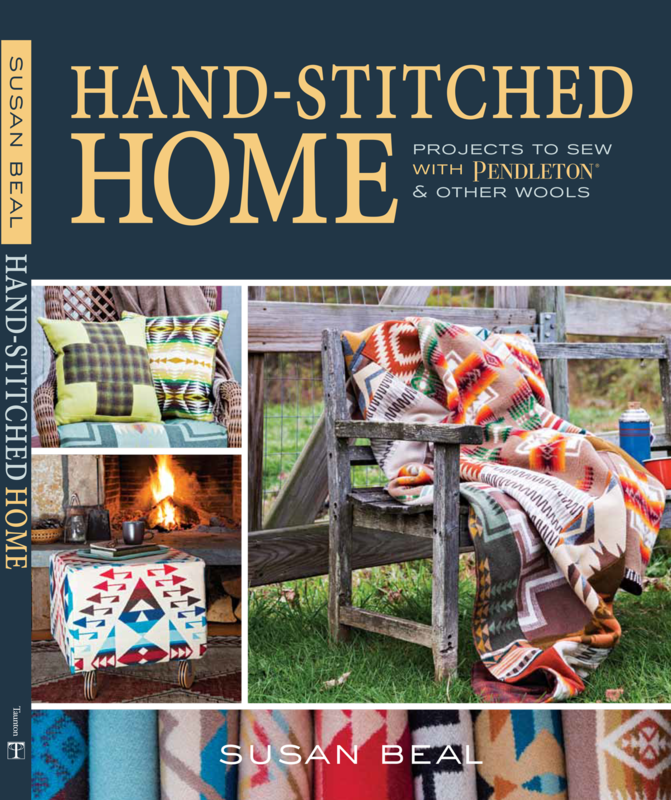 I learned to embroider when I was 8 … I remember going to the store to pick out my birthday present: two pre-printed pillowcases, an embroidery hoop, a book of stitches and four skeins of variegated floss. I still have those pillowcases, and I won’t tell you how old they are! I learned embroidery many many years ago around my neighbors kitchen table. During hot Florida afternoons we would gather with my sister and another friend. I will never forget her or her mother because of these moments. 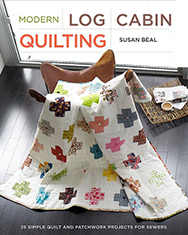 I have continued with embroidery, cross stitch and now hand quilting. I love looking at my work as part of the process and the feel of the thread and the fabric. My latest projects have been crazy tea towels. I have sent both my kids, who are out of town, towels with day of the dead skulls, virgin of guatalupe and Chinese dragons. They laugh and enjoy the crazy tea towel collection I’ve started. And I get to practice new stitches. I’m a completely self-taught stitcher. I love the quiet focus it takes. Sort of mental yoga? 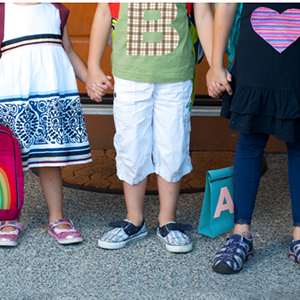 I have stayed home with my son for five years (yay for Kinder this year!!!!) and stitching has always been part of the evenings, relaxing while hubby watches tv. 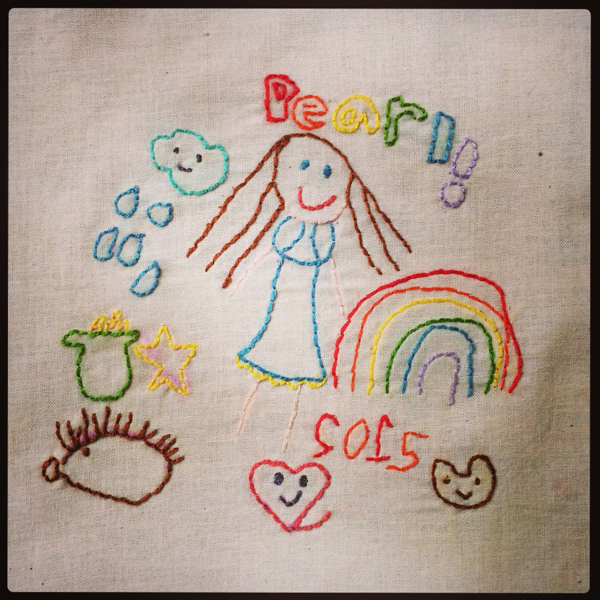 I did my first stitching as a kid: a little crewel kit – & I taught myself the stitches. I am happy to say I still have that first attempt, framed & hanging on my wall! I stopped stitching for awhile and didn’t start again until I was married & my mother-in-law introduced me to cross stitching. I taught myself embroidery stitches then too & really enjoyed it and I started making stitched gifts. It was then that my Grandmother pulled out some embroidered tablecloths & napkins that she had tucked away that were made by my Great-Grandmother! Neither my Mom or Grandmother were stitchers, so I never knew that this was something that my Great-Grandmother had enjoyed, or that my Grandmother had saved these treasures. She gifted them to me and now, every time I stitch, I feel that creative connection to my Great-Grandmother & feel delighted to have inherited this love of embroidery from her! I learned to embroider in my 7th grade home ec class. Embroidery was one of the things we had to do on the pillow kit that was our “sewing” component. I made an ice cream cone. I got so excited about embroidery that I started collecting floss (it was 25 cents a skein then) and took a project with me on my plane ride that summer. I still pretty much only feel capable of the stem stitch and lazy daisies, and that plan project is one of my few completed embroidery projects. But watching your recent projects on IG has me itching to start a new one. 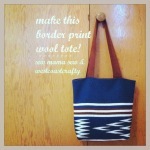 Stitching is a great way to escape from your daily problems you may encounter… Your works are amazing! With your care and assistance, all is possible, I know! Thanks for this information. I like it.